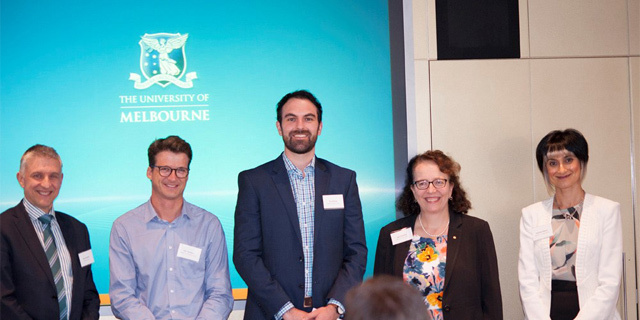 Earlier in the year, the Melbourne Medical School’s Research and Research Training Committee decided to organise a research symposium around the theme of the clinician researcher. The careful planning of the committee culminated in a special, whole school event held in the Woodward Conference Centre on the 23rd of November, 2017. The intention of the event was threefold: to celebrate the major fellowship and grant successes across the school this year, to provide a platform for clinician researchers at different stages of their career to share inspirational and engaging stories from their personal experience, and to enable researchers and staff from different departments and sites to mingle and network in a collegial environment. Proceedings commenced with a welcome from Prof Geoff McColl, Head of School, who acknowledged the work of the committee and the fellowship and grant successes across the school this year. Each speaker provided entertaining vignettes from their individual journeys and showcased the breadth and variety of clinical research that is taking place across the school. Following the presentations, the evening concluded with networking overs drinks and canapés. The school is aiming to make this event a yearly tradition, so be sure to get involved next year!